This luxury 24 storey high rise building represents an assault on the heart of Mumbai. This is in Mahim geographically the heart of the metropolis as Mahim connects the island city with the suburbs. The skyscraper is an eyesore amidst low-rise housing but more than that it has come up on the bus depot of the BEST Undertaking . The BEST transport undertaking was once the country’s showpiece in public transport now driven into a shameful crisis mainly due to the policies of the state government and the municipal corporation. The city managed yesterday to postpone a strike by BEST employees who are finding it difficult to get their monthly pay. This is a glaring example of what is wrong with urban governance. Is it is not a paradox that millions of sq ft. of space has been made available for luxury housing and corporates and retail shopping in the metropolis in the last few years but the space for public transport is being reduced due to governance policies.This is a space robbery. The space bonanza for the rich has been facilitated by government policies. Hundreds of acres of land became available in Mumbai following the closure of textile mills and several other industries in the last three decades. Much of the prime space has been grabbed by the rich. Even then they are not happy. There is further encroachment even here. That is what explains the large number of illegal constructions in the Kamala mill compound which led to the disastrous fire in a posh restaurant that led to 14 deaths recently. It has exposed massive corruption in the civic body and flouting of norms by the rich. For a growing metropolis with a huge increase in demand for public transport, there should have been more space allocation,acquisition of land for public projects.Far from providing this, the authorities are contributing to reduction of such space. In contrast, the State was much more friendly to common people and provided substantial housing for the weaker sections. The sprawling Machhimar colony for the fishing community built by the state housing board in the seventies just behind the Mahim high rise provides a sharp contrast to this building. There are 10 buildings each with 40 tenements of 330 sq ft. and 10 buildings with 40 tenemens each. It is a little township with good roads, wide footpaths, quite nice actually, peaceful and with little traffic. There are several such housing board colonies and these are already being eyed by unscrupulous builders. It is a task for people’s movements to protect all such spaces. In contrast to the State giving public land for ordinary people in the past, the State is now seen to be turning into a predator as in the case of the Mahim bus depot. The BEST has got a pitifully low amount for the allotment of land for luxury housing in the depot. In the process, the loss to public transport is serious. And this is not an isolated case. The land of other depots is on sale.. I visited Mahim depot or what remains of it this morning. Bus operations from here have been stopped for the last several months.I was denied entry. But the area for buses is now shamefully small and by all accounts it looks claustrophobic as buses will have to operate from under stilts of a car park. This shows the real subjugation of public transport by the authorities, an affront to common people. Little space is left for buses, horizontally or vertically. BEST’s name has been literally obliterated from the site while the building’s name Kanakia Miami is splashed in a big way along with pictures showing how the rich will live in splendor in the building. There is a very large picture of a rich family with half a dozen dogs, one in the arms of a woman. There is also a large picture of the Mahim Bay which the building overlooks. And there is a picture of children having a nice time with swimming costumes and skateboards. Find your kind of people says the big caption for a picture. So the rich can cohabit with other rich here. So much for the nonsense of inclusive cities the authorities talk about. So here we have an exclusive building for the rich on a public land. Reminds one of the eminent urban thinker David Harvey’s thesis that much of capitalist urban growth is a result of Accumulation through Dispossession. Mahim is a historic area whose history predates Portugese and then British rule and goes back to the 13th century. It has also been all these years mainly a low-rise area. It had escaped the onslaught of builders to a large extent. Now the new gentrification poses a serious threat to this once tranquil area. This building is right at the junction of Mumbai’s main artery and is opposite St Michael’s church. So grave is the threat posed to BEST Undertaking and public transport that several prominent citizens, academics, experts from the field of planning and urban transport have issued a joint statement calling upon the civic administration do some justice to BEST on whom millions depend for transport. The statement said `We condemn the fact that the budget for 2018-19 presented by the BMC does not provide for a grant for BEST bus services. The BMC Commissioner is demanding that the BEST first implement his unilateral demands or ‘reform package’ that includes: (i) increase in fares, (ii) reduction of routes, (iii) partial privatisation (wet-leasing), (iv) reduction of workers’ emoluments (through freeze of D.A., cancellation of medical allowance, cancellation of welfare schemes for workers, etc), and (v) increased workload on officers. His argument is that the BMC cannot sustain financial support to BEST. However, it should be noted that it is standard practice worldwide, and in every city of India, to subsidise public transport, in the interests of the whole city. Some cities, such as Paris and Seoul recently, have also taken steps to fight days of extreme air pollution by making public transport free of cost on those days. Mumbai’s bus transport is already too expensive in relation to the incomes of its users, and this fact has led to a fall in bus ridership. Such a reduction in public transport goes contrary to widely accepted norms of urban planning, as it leads to increased congestion (due to greater use of private vehicles), greater pollution, and a worsening of public welfare. Moreover, it is essential for the economic vitality of the city that workers and employees be able to travel to and from workplaces in the shortest possible time. BEST bus transport has always received a financial subsidy from the BEST’s electricity division. The only difference is that now, since it is no longer allowed to receive a cross-subsidy from the electricity division, it has to be subsidised directly by the owner of the whole undertaking, namely, the BMC. The change is only one of the form of the subsidy. It is revealing that the BMC has no problem finding Rs 1,500 crore (more than enough to meet BEST’s funding requirements) to allocate to the coastal road project, which will in the main serve private automobile users; yet it refuses to support public transport. This is a downright regressive stance. If the BMC needs funds for public transport it would be logical to charge appropriate parking fees and tax private automobiles for the multiple costs they impose on the city in terms of road maintenance, congestion, and pollution. The BMC has no shortage of funds overall. It is the richest municipality in the country, groaning with Rs 69,000 crore of fixed deposits. Yet it refuses to fund an essential service of the city. The authorities have periodically declared the BEST an essential service, in response to workers’ strikes. Yet they now are treating it as a non-essential service, and going on a ‘funding strike’. The BEST needs new buses, and various reforms to improve services for users. These can be brought about by making adequate investments, creating dedicated bus lanes and BRTS to give priority to buses (something that is already practised in the case of suburban railways) and improve commuting speeds, working with organisations of citizens and BEST workers, not by creating a crisis and imposing terms unilaterally. The BEST has had a history of providing excellent service to Mumbai. The problems of recent years have been created by repeated fare hikes, lack of investment, and a Government policy favouring private automobiles. The latter has led to unbearable congestion. 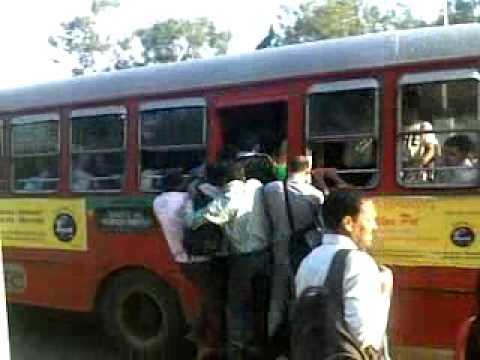 Instead of manufacturing a crisis over BEST’s funding, the BMC should be providing funds to strengthen public transport. Shweta Wagh, Asst. Professor, KRVIA. The site for the building provides easy mobility to the rich who can ride in their cars on the Bandra Worli sea link and to the airport via the nearby Western express highway. That is fine. But this form of development is seriously worsening the mobility of the poor. Vidyadhar Date is a senior journalist and author of the book Traffic in the era of climate change.